A mild, airless day at Pett Level. The shingle beach, equidistant between Hastings and Rye, is deserted. There is an ominous sky: slate grey stratocumulus. It strikes me that the most expensive pop music video ever made on an East Sussex beach could have been made today without David Mallet’s chiaroscuro effects. In May 1980, David Bowie descended on this beach with a Pierrot costume, a cast of extras culled from Blitz - the New Romantic club du jour – and a JCB digger. Bowie had recorded his last great album – Scary Monsters (and Super Creeps) – before the commercial highs and critical lows of the 1980s, and the first single from the album, Ashes to Ashes, was to be released in the summer. Bowie saw video as another emerging art form, rather than just an opportunity to act badly or Monkee around to shift some product, and he enlisted Mallet to help him produce four minutes of surreality that would be beamed into everyone's living room weekly on Top of the Pops, once the single became a number one. Intercut with mostly black and white shots of Bowie in a padded cell, dentist’s chair and on alien life-support (natch) looking knowingly to camera, Bowie’s Pierrot strolls along the beach at Pett Level; flanked by Steve Strange and his muckers dressed as papal new puritans, and followed closely by the JCB, Bowie seems to be burying all that marvellous nonsense bookended by this song and 1969’s Space Oddity. 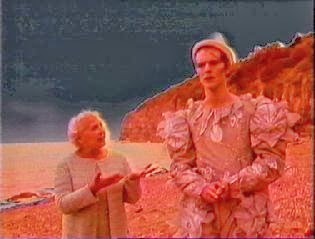 The closing shots show Bowie being harangued on the beach by a representation of his mother – all bleached peach – under an artificial black sky, to the refrain: “my mother said to get things done you better not mess with Major Tom”. Of course, he did get things done and 2013 is being heralded as the return to form of David Bowie; but this is to deny his bravura music of the 1990s – The Buddha of Suburbia and 1.Outside – and the noughties – Heathen and Reality. However, when the eight-year hiatus since his heart attack came to an end, with – bizarrely for me – an announcement on Radio 4 at 6am on a cold January day, it didn't stop me rushing downstairs to the computer to blub and snivel over the video of Where Are We Now? along with all those others for whom, at one time, only David Bowie seemed to know.